That's THREE AND A HALF years (one time + two times + 1/2 a time)! That is the second half of Daniel's 70th Week, and it is a period of time known as the Great Tribulation (Matthew 24:21). It is the Time of Jacob's Trouble. Satan has been cast out of heaven and LET LOOSE on earth. He is no longer restrained! His standing up starts the 3 ½ years of the devil’s wrath on earth against the saints (Rev. 12:11) and Israel (Rev. 12: 13). When we examine Paul’s words in II Thessalonians chapter 2, we see that he too was referring to this exact time. This is how the Antichrist will be revealed once the restrainer moves out of the way. The Lord Jesus says that we are not to wait for the Antichrist to sit down in the Temple, but to flee if we see him even standing in the holy place. Because, once he is seen standing in the holy place, just as assuredly, he will sit in the Temple...and then he will begin to persecute the saints of God! Once Michael casts the devil to the earth, he then steps back (or stands up) and allows the devil to have his way with Israel. The time of trouble begins when the restraint is removed from the ‘mystery of iniquity’ allowing the Beast to emerge unrestrained on the scene. Since the Lord Jesus quotes Daniel twice in the Olivet Discourse, thereby connecting the Antichrist with the final king in Daniel’s vision (cf. Daniel 11:31, Matt. 24:15), and since Paul’s remarks about the man of sin sitting in the temple parallel Jesus’ mention of the “abomination of desolation,” it is very likely that Paul had Michael in mind when he spoke of the restrainer. 1. The angelic army is neuter, and Michael their commander is singular masculine. 2. They have been around for more than 2,000 years, so they meet the time requirement. 3. They are spiritual beings. 4. Michael is clearly seen in scripture to be the counter force to Satan (Jude 9, Rev. 12). 5. 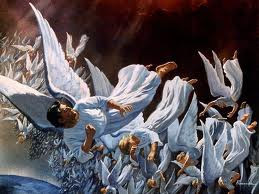 Michael and his angels are more powerful that Satan and his angels (Rev. 12:8). While we may not be able to say with certainty that Michael and his army is the restrainer of II Thessalonians chapter 2, he/it is the best fit by far. And, incredibly, we have biblical support for Michael being engaged in just this type of restraining activity in Daniel 10. There is NO such scriptural support for the Holy Spirit being the restrainer. Furthermore, if Michael is the restrainer, then the whole pre-Tribulation argument from II Thessalonians 2 collapses. There is no Scriptural warrant for the teaching that the Holy Spirit will be removed from the earth. And, there is also no Scriptural warrant for the assumption that the Church is removed with the Holy Spirit before the revealing of the Antichrist. As a matter of fact, if Paul did indeed have the removal of the Church in mind in verse 7, then he would be directly contradicting what he had just written in verses 1-3. Because there he said that “our gathering together unto him” will not occur until AFTER the apostasy and the revealing of the man of sin.